Wim Veling, deputy professor of Psychiatry at the University Medical Center Groningen (UMCG), was given an inaugural lecture due to his research on “Psychosis in the social context”. With this research he developed new ways of diagnosis and treatment, such as VR therapy. 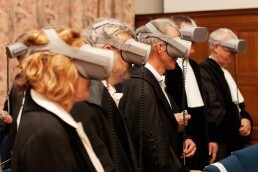 The inaugural lecture was therefore not presented as usual, but by means of VR to show the power to those present. As soon as the Oculus Gos went on, the attendees experienced different situations in VR. They hung at the edge of the Martini tower in Groningen (fear of heights), they were chased on the streets (paranoia), came into a fight with a group (aggression) and swam with dolphins (stress management). 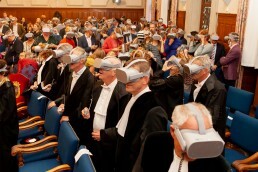 The 360° video, which was created by VIEMR, was simultaneously shown to the 200 attendees by means of the VR Sync software. The 200 attendees felt the power of VR at the same time. The situations that were portrayed in the 360° video showed the attendees why VR can be such an effective tool to help people better deal with their social environment. It was a special moment for those present and Wim Veling.